A ten-piece ska-punk act is quite unusual. Heck, a ten-piece roots ska band is quite the find these days. But Boston, Massachusetts' Big D & The Kids Table shakes up the norm with their blistering ska-punk, complete with a gigantic horn sound. On this five song EP, they serve up four live tracks, as well as one 8 track demo. Announcing "Fatman," the opening track, as "new, well, at least to us," the CD has no problem getting a reaction right from the get go. There is no way you'll stay passive as you listen to this. The vocals take a few seconds to fully incorporate with the music. But, everything else flows together quite smooth. The horns impact the song nicely, always contrasting the shouts and hard pounding drums, giving the song a softer edge that plays a nice companion to the irresistible sting of the guitar. The bass helps thicken everything up, strengthening the punk roots the song seems to be built on. Together, they are able to get the blood pumping, the energy rising, and your feet moving. Although, you might find yourself bouncing off walls rather than skanking to this song. The punk outweighs the ska quite a bit during times, and more subtly during others. "Hey" finds the band digging deeper into their punk foundation. Starting off soft, the horns lead the way through a very gentle setting that includes light percussion, just enough force from the bass, and an upbeat that just crawls through the song. But it doesn't stay this way for too long. Very misleading, you'll soon be forced against the wall as the song bursts into the punk with one big, sudden leap. Ska traces are evident here and there, but you won't be skanking to this one. Without thought, you'll find the number infectious enough to get you bouncing off walls, starting a pit, or some other crazy reaction that helps release all your tension. Any route you choose, you can rest assured the sudden jump from ska to punk will invoke enough testosterone in you to make you want to go wild. Ending with "51 Gardner (8 Track Demo)," they give you a chance to compare their live show to their studio performance. Maybe it's just the demo status of this song (they probably haven't fully developed this song), but their live stuff is so much more energetic, causing it to pack a bigger punch. Then again, maybe they are just that much more active live. Anyhow you look at it, this track brings the action-packed reactions to an abrupt stop. But don't get me wrong. It's not a bad song, it has a lot of good features, it just doesn't seem as vivid as the others on the disc. Live EP's are usually just a desperate attempt at feeding a band's fan base until they release something, more 'concrete.' 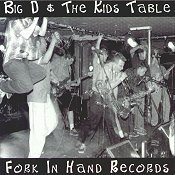 But Big D & The Kids Table avoids all these tracks and keeps their live material sweaty, to say the least. If you've heard this band's debut split CD and you weren't impressed, maybe you need to hear them again...LIVE (on disc). As displayed by the demo track on here, their live material just ups the ante that much more. I'll give this a B+.